Sinn Féin TD for Wicklow/East Carlow John Brady has commended all those who turned out today in support of Ardmore Studios outside Leinster House. 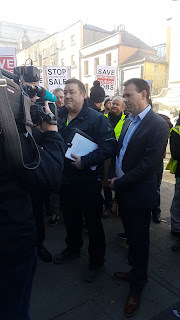 “I was delighted to join with protestors, who are predominately workers within the film and television industry, outside Leinster House today in support of Ardmore Studios and its continued existence as it is in Bray. I also joined the protesters in handing in a petition with over 2,500 signatures to the Minister for Jobs, Enterprise and Innovation. “The recent announcement that Ardmore Studios is to be sold came as a huge shock to all those involved in Ardmore Studios and also to me as a public representative. During previous meetings I held with the CEO, discussions were about the expansion of Ardmore Studios and never any potential sell off. The huge concern was highlighted in the huge numbers that turned up to the protest today. “Ardmore Studios are internationally renowned as Ireland’s leading provider of film and TV studio infrastructure. The studios are highly regarded and have been home to hundreds of national and international film and TV productions since it was established in 1958. “The silence from Ministers Heather Humphries and Mary Mitchell O’Connor to numerous representations that have made to their offices cannot continue. “On the one hand, Minister Humphries has launched a new economic analysis on screen based creative industries and on the other, both Ministers have failed to address the potential sale of the State’s almost 32% share in Ardmore Studios. “The Ministers must confirm that the State’s shares will be protected and if the private shares are to be sold; this must be as a going concern. Any unconditional sale of Ardmore Studios will not be acceptable. “It is essential that the prospectus in relation to the sale of Ardmore Studios is made available to both the employees and concerned public representatives.